Scale the Summit is one of the bands we at Prog Sphere have strong connection with, being one of the bands we had covered when we have been starting out back in 2010. With four studio releases, the Houston instrumentalists have separated themselves from the overcrowded community of technical metal bands and established a name you can count on. Prog Sphere spoke to guitarist Chris Letchford about their latest studio installment, the line-up change, creative process within the band, and many other cool things. Read on. The Migration was released in June 2013. Would you agree that it’s the strongest release you put out to date? Tell me about the writing process of the album. Chris Letchford: Definitely the strongest, but part is due to finally getting the recording quality we have always wanted. Very raw and natural sounding instruments, with less squashed and compressed tones. I pretty much write year around as long as we are not on tour. I like to get ahead so we aren’t forced to write an album inside a couple months. I get 90% of all the guitars written and then send it off to our drummer and bassist to write their parts, usually with notes, but for the most part we are all on the same page. It goes pretty smooth. Were there any changes in your writing approach comparing with previous three albums? Chris Letchford: Not really, I would just say a natural progression from getting older, learning the instrument better, improving in general on song organizing. How does the album name effect the showcased material? What is it you wanted to migrate from with this record? Chris Letchford: Its more of a literal approach I guess, since we are always looking to improve. It felt right at the time, plus the artwork Duncan Storr made really sealed the deal for the title. Chris Letchford: Thats a tough one, I really just sit down and write, what comes out comes out. I don’t have any cool rituals that I do before hand to get inspired. Normally nice weather gets the ideas following. How do you classify what you do with Scale the Summit? Chris Letchford: Adventure Metal, even though I think to use the term “metal” we would need a screamer, since you can find distorted guitars in the Blues genre. Though you are an instrumental and technical band, it’s hard for me to picture you together in the same basket with of Malmsteen, Vai or Satriani. What is your way of seeing things? Chris Letchford: Agreed, love the players but this is more of an instrumental “band”, where everyone has their equal moment to shine, and all parts from all instruments are what make the songs the way they are. We are still marketed in that realm though and would love to tour with each of them! 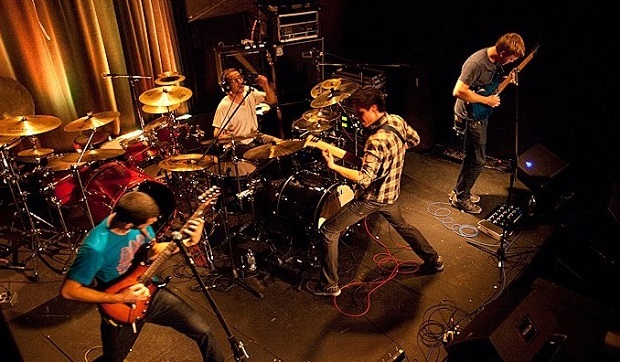 Many instrumental bands today get lost trying to experiment with the extreme side of metal, resulting in “yet another djent band”, but Scale the Summit has distanced from such approach establishing unique tone. How did you go about it? 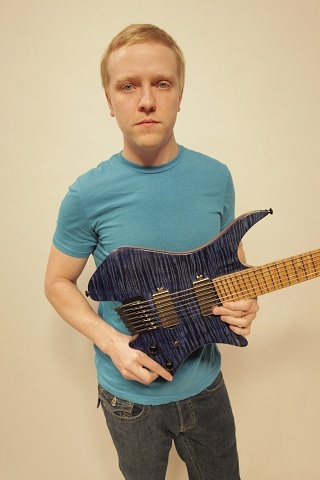 Chris Letchford: We were already writing music before “Djent” became a thing so we have just kept doing our own thing. Too much time gets lost focusing on what others are doing, though I enjoy a lot of the bands in that genre, its not shot to them, there are a lot of them that do it really well. What were the circumstances surrounding Jordan Eberhardt’s departure from the band in 2012? Chris Letchford: He didn’t enjoy touring anymore. You’ve been touring quite a lot since the album release, playing shows with TesseracT, Anciients, The Reign of Kindo and Jolly. What is the response on the new songs from the audience? Chris Letchford: The response has been great, plus we have thrown in improv into our set which brings an entirely new approach to the live show, as well as the tour we start tomorrow, video performance. You will be co-headlining the upcoming March tour together with The Ocean, with Тhe Atlas Moth and Silver Snakes as support. Though the accent is on the new album, will you be changing the setlist drastically comparing with the last tour? Chris Letchford: I wouldn’t say drastically, but we have thrown in songs we haven’t played in a while. In April, you have a scheduled appearance on Cruise to the Edge together with many great artists including Yes, Steve Hackett, Tangerine Dream and more. Are you preparing something special for this special event? Chris Letchford: There isn’t really much extra we can do for events like these when not the headliner, so we’ll be doing our set as usual, but hopefully get to do the video projection stuff as well. You played last year’s Yestival. What are your memories of that event? Chris Letchford: It was awesome, it brought back memories of all the huge stages we got to perform on when we toured with Dream Theater. YES have been a favorite of mine since I was kid, so it awesome. Your guitar solos are definitely a separate territory when it comes to the STS song structures. What is your approach when working on this specific segment of the writing process? Chris Letchford: I spend a lot more time editing and changing parts when writing solos. I first decide on the backing riff for the solo section, analyze the key and all the different options for what I can play over it, then I’ll improvise over it until some ideas get sparked and then build off that. Besides all the technicality, you managed to give the guitar a voice rather than going full on showing your abilities and skills. Elaborate on your technique. Chris Letchford: Yes, we’re definitely all about the song first rather than showcasing chops, but remember thats subjective. To our fans, being mostly musicians and technically proficient guitarists, our music doesn’t seem over the top, but to someone with no musical experience we are now “arrogant fretboard wizards”. So we just like to keep it melodic and memorable first, and then add in the more technical parts when its appropriate, like a climax of a solo or part of a song. 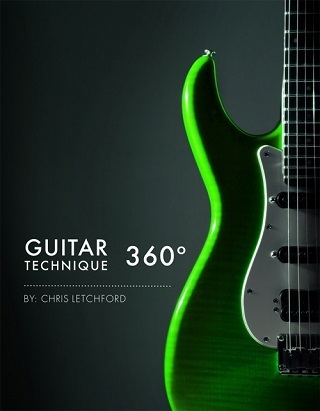 Speaking of technique, you have a new book – “Guitar Technique 360˚“. Tell me something more about it. Chris Letchford: I have always enjoyed teaching, and with my time being less free for students books were a way to offer more people a chance to learn my approach to the instrument, what I like to practice, things I think will help push the player, and for less money. I haven’t really found a technique book that really ventured outside of just the normal scale exercises. So I wrote this one to really utilized more melodic and usual ideas that can be applied to everyday guitar playing and song writing. What is your way of channeling inspiration into writing? Chris Letchford: I normally don’t use others music as inspiration. I learned early on that I wasn’t able to recreate some of my favorite players. I wanted more than anything to write like Tom Morello from RATM, but he has his own sound, just like I will have mine. I normally don’t listen to a lot of music when I plan on writing, to help not get distracted. What non-musical entities and ideas have an impact on your work? Chris Letchford: Nice weather outside, my great danes, and seeing anyone accomplish some type of success is always inspiring. Where do you see Scale the Summit in the future? Chris Letchford: Hopefully still releasing records. So many bands barely make it to 2 albums, and we just released number 4. So I hope to continue releasing music. I have a all clean solo album coming out soon with drums, bass and piano. So Im excited to see what STS fans think about it.